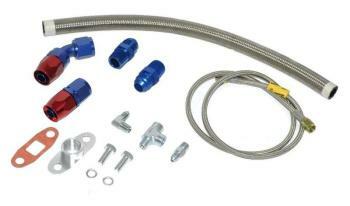 Treadstone Turbo Fluid Line Kit - Dezod Motorsports Inc - Home of the automotive performance enthusiast since 2002. A complete solution to your turbocharger oil supply and drain. We only use the best Goodridge hoses and fittings. Includes everything pictured. No welding required! Install to oil pan by punching hole & taping with 1/2 NPT tap. Made in the USA. Weld fittings available also.